Ever wondered what might be possible on a mountain bike? So did some of the most extreme mountain bikers on the planet! As a result, the Red Bull Rampage is now an annual bike race. Find out how far some of the best can push themselves and their bikes when world class mountain bikers converge at Zion National Park in Southern Utah. The Red Bull Rampage is modeled after extreme skiing and has been described as the most prestigious mountain biking challenge in the world. Read a little more about it and then watch a couple bike videos of the riders making their way down the treacherous mountain bike course. Want to see more of those career ending 200 foot drops, speeds in excess of 40 miles an hour, gigantic vertical downhills, full back flips, 60 foot gaps and monstrous step downs? Catch even more thrills than you can imagine on a mountain bike in the hour and a half long television episode of the Red Bull Signature Series. Stream this YouTube bike video full size to your big screen! 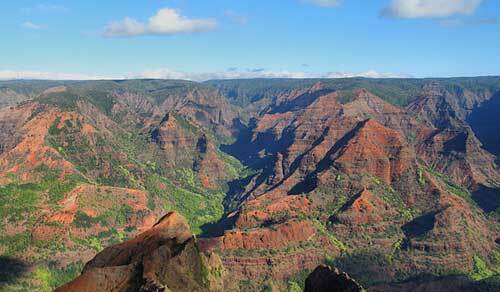 image of Waimea canyon on Kauai for Hawaii mountain biking challenge. What do you think? In addition to the XTerra World Championship at the Kapalua Resort in West Maui, could Hawaii host one of these extreme mountain bike challenges? I’d guess the only place with possibly similar terrain challenges could be the Waimea Canyon on Kauai. Waimea Canyon image by photographer Kyle Pearce, originally posted to Flikr. In the meantime, extreme mountain bike riders can indulge their urge for extreme mountain biking on Maui with Haleakala bike ride. Before heading out, stop at West Maui Cycles for the best mountain bike rentals on Maui! Take a look at the Specialized Stumpjumper mountain bike rental with full suspension or the Specialized Comp 29er Hardtail for your decent down Haleakala. For slightly less extreme mountain bike rides on Maui, the Cannondale Quick CX4 Hybrid bike rental and the Specialized crosstrail rental bikes are available. Sharing a Maui cycling vacation with road riders? We also have Maui road bike rentals and Electra cruiser bikes for rent. Whatever you need, stop into West Maui Cycles bike store in Lahaina.